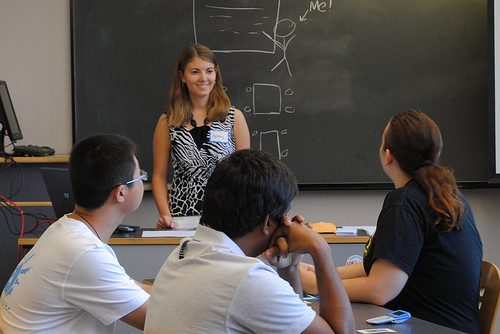 Learning New Lessons -- Tips for Rookie Teachers | So You Want To Teach? If there’s one profession that generates both joy and frustration in equal amounts, it’s teaching — veterans will attest to the fact that they’re extremely satisfied one day even as they want to tear out their hair the next. Those who are familiar with the ups and downs associated with the trade are able to adjust accordingly and not feel too stressed out even before the middle of the school year, but if you’re a rookie who’s just entered the world of teaching, here are a few tips to help you cope with the rollercoaster ride that you’ve embarked on. Organization is in Order: Sloppy and untidy teachers set a bad example and do not instill confidence in parents, students or the administration. As a teacher, you’re going to be inundated with a host of material that you must keep organized if you’re going to have to make sense of it at a later date. If you’re not comfortable with the filing system that the school uses, use your own way of putting things in order. Experience is an Education: Any school has its share of veteran teachers, and it’s in your best interests to tap their brains and experience to further your career. Ask for tips and advice on dealing with troublemakers in the class and on preparing lessons and making them more interesting. You’ll find them a veritable treasure trove of information that will come in handy throughout your career. A word of caution though — some old timers do tend to be jaded in their outlook because of bitter experiences with problematic kids and an insensitive administration, so don’t let this sense of gloom dull your anticipation and enthusiasm. Take only the positives and pay no heed to the negatives. Prepare for the Parents: Your students’ parents will want to meet you from time to time to check on their child’s progress in the classroom. It helps to maintain a separate folder for each student in your class that contains all documentation relevant to him or her, especially when you’re supposed to meet the child’s parents and need information at a glance. Some parents may tend to be pushy and insist that things be done their way, so be prepared to hold your ground, firmly yet politely. Rewards and Relationships: Your role as a teacher must be neutral and impartial, no matter if a few students are your favorites. Make sure you develop a system where all the kids are given an equal chance to volunteer for classroom-related tasks. Avoid praising a few kids to the skies or punishing some of them constantly for bad behavior. Be on your Best Behavior: A teacher has a reputation to protect, both inside and outside the school. So even if it’s a weekend or a holiday, maintain professional decorum when you’re out in public so that your students and their parents don’t lose the respect they have for you. I think the last bit of advice–be on your best behavior–is the one that is often hardest for new teachers to understand fully. Most people getting into the profession know that you need to be organized, treat people with respect, etc. However, when the day is done, and it is Friday, the idea that you are still a teacher, just out in public, is a hard one for many to grasp. For some, it is hard to grasp because in their previous job that was not an issue–few computer programmers need to worry about this. For some, it is hard to grasp because they are young and a wild life is what they are used to. For some, they do not understand that there is not much distinction between your professional and personal life as a teacher. It is a grey area. This area of what is personal life and what is professional life has had its court cases and disputes over the decades, my favorite being the idea that a teacher could not join an organization/group, for participation on their own time, if the group was not like, e.g., membership in a communist or socialist party group. The choice of the person to join was upheld. However, being drunk in a public beer garden is not in your best interest. Additionally, you are new, you are young…the students are not your friends. I am about to graduate with a degree in education, and I found this blog very interesting. It’s good to see the things that are being drilled into our heads everyday in our classes be written down by someone on the outside. I know that from doing my student teaching alone that organization is so important. In special education we have so much information that if everything is not organized you will fall apart. I also think that being neutral and impartial to your students is a necessity. Not everyone learns and behaves the same and in order to be an effective teacher you sometimes have to look through the child’s difficult behavior. I remember teachers showing favor to others when I was in lower level schools, and I HATED it. I do not want to be that teacher for my students!